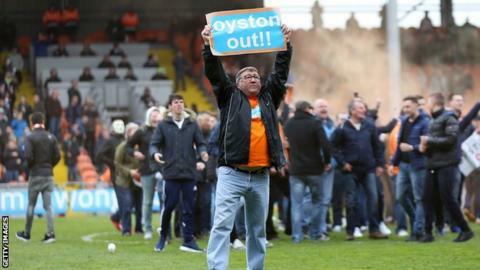 Relegated Blackpool have been charged by the Football Association over the pitch invasion that caused their final Championship fixture of the season with Huddersfield to be abandoned. The club have been charged with "failing to ensure that no spectators or unauthorised persons were able to encroach onto the pitch area". Blackpool have until 28 May to respond. The invasion followed a march by around 2,000 fans before the game on 2 May in protest against the club's owners. Several hundred fans gathered in the centre circle on the Bloomfield Road pitch shortly after half-time, before the game was eventually called off over an hour later. The Football League has since declared that the result should stand at 0-0 and also charged the Seasiders with failing to fulfil the fixture. Lancashire Police said they were continuing their investigation to identify the "small minority of supporters who overstepped the mark". It was the latest in a number of disputes between fans and owner Owen Oyston and chairman Karl Oyston over their running of the club. Blackpool, who finished bottom of the Championship, announced on Tuesday that 17 first-team players were being released, leaving them with just 10 currently under contract.